I've had some people want to attend the Bun Cooler, but they aren't members. The only way to register is to go to the calendar of events. You can't go there if you aren't a member. Once there you can register as a member or non member. Can't we have the calendar of events a non member area? Jim - I'm not seeing the problem. On a different computer as a non-member, I went to the calendar. The link took me to the log in page. At the bottom of the log in page is a button that says, "I just want to register for the event." Yeah, not real clear, but it is what it is. If your contacts are having problems getting to the calendar, it's probably because of their browser. I know because I've been through it before. Clear cookies, reboot, yada, yada. Here's a slightly confusing factoid... Those wanting to register as a guest can first create a Forum Subscriber account. As far as the online system is concerned, Forum Guest Subscriber accounts are classified as member although their pricing structure is different. People aren't going to do it if it isn't easy. You shouldn't have to clear cookies, etc. just to register for an event or go through multiple steps with hidden links. Most motorcyclist aren't computer geeks. These events are one way we recruit new members. It should be easy for even us knuckle draggers to maneuver through the site. It is most likely that the event was not set to public. The calender and event operations is what it is. We bought the lower cost solution with less features. Overall, the number of user issues with the online system is very, very low. There will always be the occasional real glitch and folks who are computer neanderthals. It is difficult to control what people do with their computer, browser, router, etc, and if something happens or gets corrupted locally, then it is easier to have them reset to a know state that has proven to work most times. Hopefully most members will understand that as a volunteer club there is no way to provide a tech support department, and to help keep member dues from increasing there will be compromises. We bought the lower cost solution with less features. This post has taken me some time, done as a commitment to the COG Forum, activities and people; so bear with me. 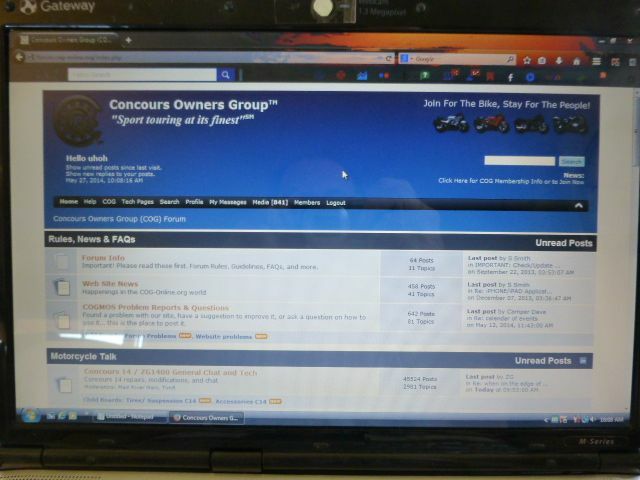 When you log on, this is what you see on the forum homepage, as a member. Slightly more headings in the black strip. On Neither Of These Pages is Anything that Says "Calendar of Events." But, here it is, as you scroll down either of these two pages you get to - "Ride Time"
drum roll, please - "Rallies, Rides, and Events." Yeah! "... Events." See Pencil point. We are here! Success at finding legendary Calendar of Events will be at hand, for sure. Not; there's no Calendar of Events present. NADA, like in none. 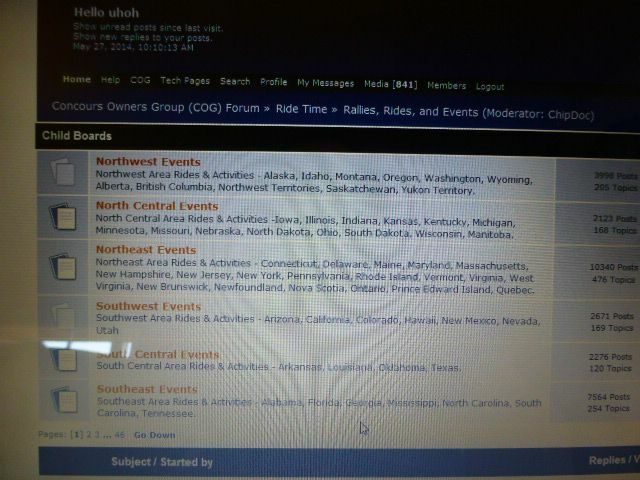 So, what is administrator to do to get the Calendar of Events placed under the "Rides, Rallies and Events" heading? There are 6 sections geographical regions ID'd here: NW, NE, etc. Shorten the titles. Add a 7th labelled "Calendar." In "Calendar," just provide a link to where it currently exists on the structure. No real changes. Straightforward. If someone wants to find out what events are upcoming, they will always go to the heading labelled "Rides, Rallies and Events." What could be simpler? But, that's not the way it is now. To get to the current Calendar of Events, you can't go to " ... and Events." Let's repeat that: To get to the current Calendar of Events, you can't go to "Rides, Rallies and Events." It's like the old Jeep commercial, "You can't get there from here." Request, just do the change. It's only a heading and a link, 4 minutes tops. This post, with photos, has taken me many, many times that. Done in order to help the COG Forum and the event organizers, members, participants. Done. Took me 5 minutes though. Please log out and test as a guest. I didn't do that as I was already over budget. Thanks for investigating and providing some clarity. The testing above was performed as a guest user, or more specifically... Not logged into the forum. If a user is logged in the main menu would have a "Calendar" link. IIRC, the original rationale of requiring an account (either free forum or full member) was so that when a user registers for an event it does not create multiple user database entries and ties their event registration to their user account. The solution WillyP came up may make it simpler for those who have not logged in, it will exacerbate the issue of multiple accounts and not enforce registration to be linked to the primary user account... thus putting more burden on the volunteer who admins the member database. Ok, that can be fixed also... I have removed guest access to the link. So i guess we are back were we started, except that, if you are logged in, this link will be more noticeable. It's not intuitive that a non-COG, forum-only, member should click on a link labeled COG to get a drop down link to the calender. 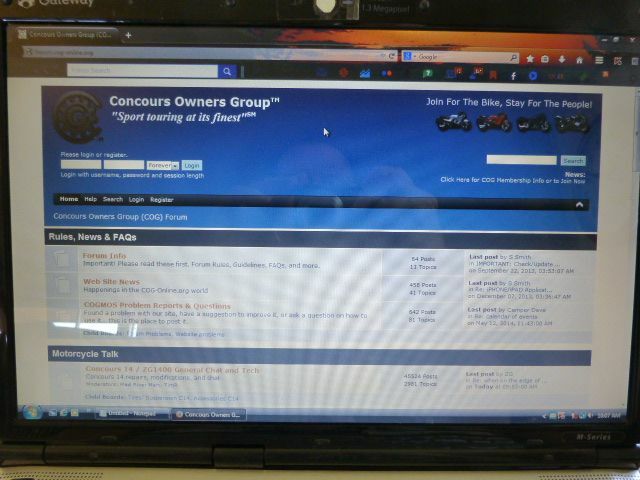 under the Ride Time / Rallies Rides and Events headings - IF I'M LOGGED IN. Just where it should be. Thanks. And the link in the child board works for me, IF I'M LOGGED IN. However, if I don't log in, and mimic being a guest, THE CHILD BOARD "COG EVENTS CALENDAR" DOES NOT APPEAR. Correct. You must, at minimum, be a member of the forum to get the link. Why not just add a link into the black menu bar that all can see. There is a link in the pull down menu under the COG heading that links to the calender but you do need to be logged in to see it. 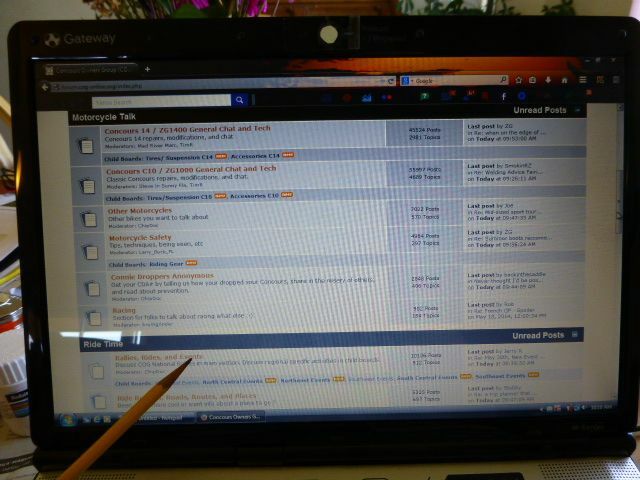 Not every new person goes to the forum first and if you go to COG-online.org there is a direct link to the event calender for all to see, it is where the info is posted, not on the forum. Steve doesn't want a link visible for members who are not logged in. It's now as you guys suggest. If the number of database duplication increase, we'll kill the link.